What Did L Ron Hubbard Learn From The Failure of Dianetics? It’s said that venture capitalists are unwilling to finance entrepreneurs who do not have a failed business or two under their belts. 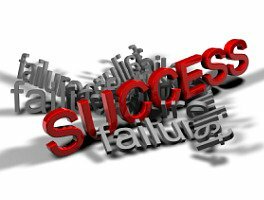 These clients will already have made the obvious mistakes, and will not fall into those traps again. The same can be true for would-be gurus, and L Ron Hubbard’s career is a good example of this. I have followed the early development of dianetics in a series of posts which examine the first articles written on the subject by Hubbard. These appeared in the popular pulp magazine “Astounding Science Fiction, where they were strongly promoted by “Astounding’s” legendary editor John W Campbell. 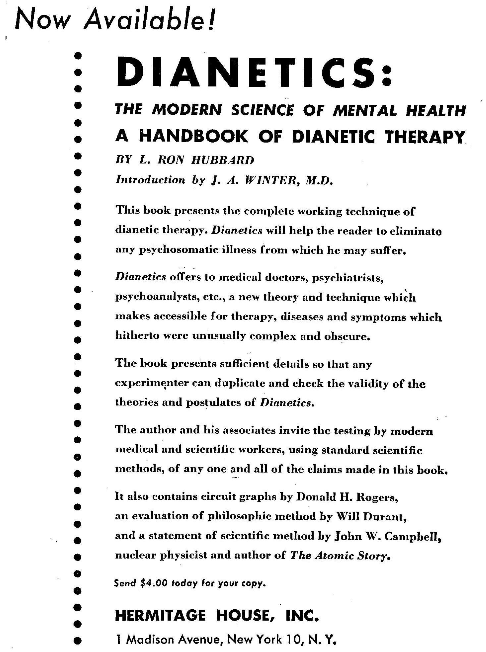 After the publication of Hubbard’s book, “Dianetics: The Modern Science of Mental Health in May 1950”, there was a brief (and lucrative) fad for dianetic therapy. This resulted in the creation of an substantial organisation, the “Hubbard Dianetic Research Foundation”. The narrative the Church of Scientology would like you to believe is that Dianetics was an immediate and enduring success and, as Hubbard refined his ideas, it gradually gave way to a more advanced version – Scientology. In fact, the “Hubbard Dianetic Research Foundation” collapsed into bankruptcy after only a few years trading and Hubbard temporarily lost the copyright to his creation. Scientology only emerged because he used his contacts to ‘acquire’ the valuable mailing lists of the “Hubbard Dianetics Foundation” and started over. In this series we are examining the 8 workbooks given to clients of Narconon’s residential ‘drug rehabilitation’ programme. This is the third post concerned with the “Narconon Therapeutic TR Course” by L Ron Hubbard (download as .pdf) which is the first Narconon workbook. It’s been hard going, but if you have stuck with it, you can clearly see that the “Therapeutic TR’s” laid out in this book are, for all practical purposes, identical to the ‘Training Routines’ taught to beginning Scientologists. Narconon is Scientology in disguise. What’s more, the TRs are clearly not fit for purpose – they are worse than useless in helping anyone overcome a drug problem. Click on image for an enlarged version in a new tab. In this post we will begin to examine the text of Hubbard’s breakthrough presentation of “Dianetics” in “Astounding Science Fiction. You can download the entire May 1950 issue (where the article appeared) from the link above. Hubbard’s contribution begins on page 43. This article finally enabled Hubbard to reach a sympathetic readership. He had previously published his ideas in the “Explorer’s Journal“and contacted academic journals concerned with psychology, hoping that they would also publish. These initial forays failed. The article in the “Explorer’s Journal” fell on deaf ears, and the academics could not make head nor tail of Hubbard’s text. It was rejected, and probably earned a note in the ‘crank letters’ file. In “Astounding” he found readers who had recently seen scientific miracles – such as the atomic bombs which has ended a bitter war. They believed that, now that Science had brought peace, it could new transform society for the better. Unfortunately, many were unable to tell the difference between real scientific discourse and Hubbard’s verbose hand-waving. Also, they were promised that, by buying the book and applying its advice they could become ‘therapists’ with greater power (and, by implication, prestige) than conventional doctors. The Dianetics fad which followed did not last – but is was enough to launch Hubbard’s career as 20th century guru. After the break, we examine the full text of the first appearance of “Dianetics” which begins on page 43 of the scan (illustrations taken from the original article). In my last post I described an advertisement for Scientology based on its supposed ‘disaster relief’ activities, and suggested that it was so misleading it broke the rules enforced by the Advertising Standards Authority. This advertisement appeared in a free (ad-supported) ‘newspaper called “Metro” and I had hoped that nobody else would lower themselves. I was wrong. 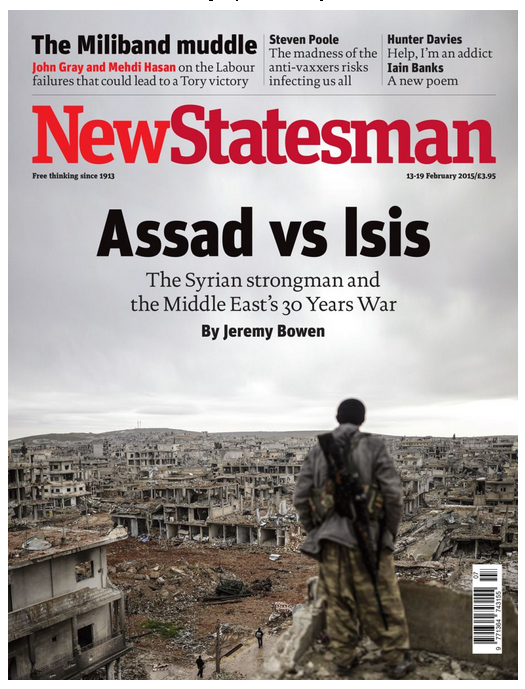 It seems it is also appearing in “New Statesman”, a respectable political magazine. After the break there is a detailed, step-by-step illustrated guide to how to complain to the UK Advertising Standards Authority via an easy-to-use online form about this advertisement. A few people who have commented on what I have posted here over the past year have asked what my personal philosophy is and whether I have ever been involved in Scientology. These both strike me as fair questions, since they influence my writing on the subject so, after the break, I will start the New Year with a presentation of my eccentric perspective on the subjects of Scientology and belief in general. In passing, I would like to point out that this blog had its first birthday on Christmas Eve. I would have celebrated, but my Internet connection had failed the day before, and it has taken me this long to catch up. Please be assured that normal service has now resumed. Also, I extend my (belated) best wishes for 2015 to all the people who have visited this site – including present members of the Church of Scientology, Independent Scientologists, ex-members and interested outsiders. Peace on Earth, among men [and women] of good will! Narconon is a front group for the Church of Scientology which claims to operate successful drug education and rehabilitation programmes, “based on the works of L Ron Hubbard” (the founder of Scientology). 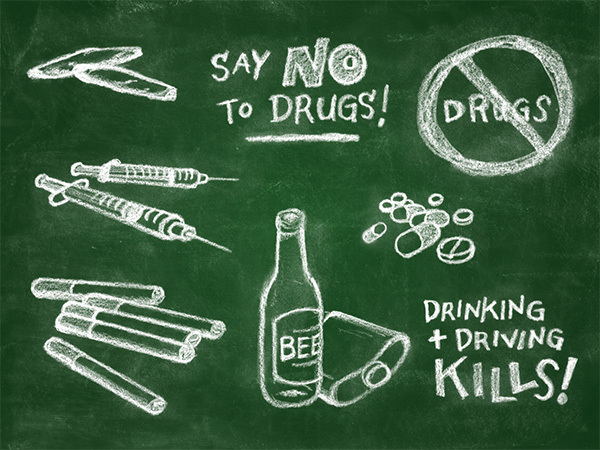 Narconon anti-drug education programmes target schools and employers. Narconon also operates residential drug rehabilitation facilities which claim a astonishingly high success rate (at least 76%). 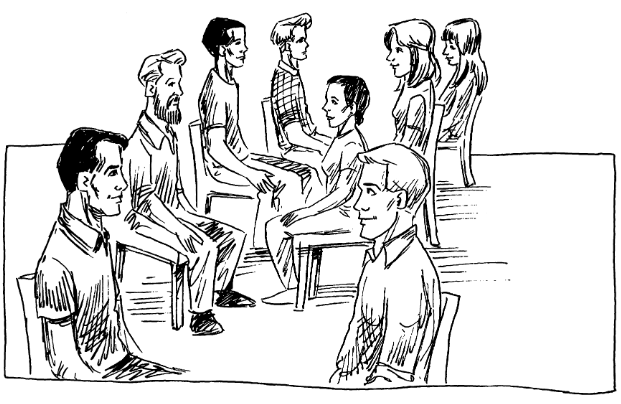 The content of the Narconon rehabilitation programme is indistinguishable from Scientology training and the organisation pays ‘franchise fees’ to another entity controlled by the Church of Scientology, which passes them on to the Church. The theoretical and practical claims made Narconon have been evaluated by researchers on behalf of two public health organisations, and two documents containing their findings are provided below (after the break). In the first, the California Department of Eduction assess the claims made for Narconon’s ‘educational’ programme. 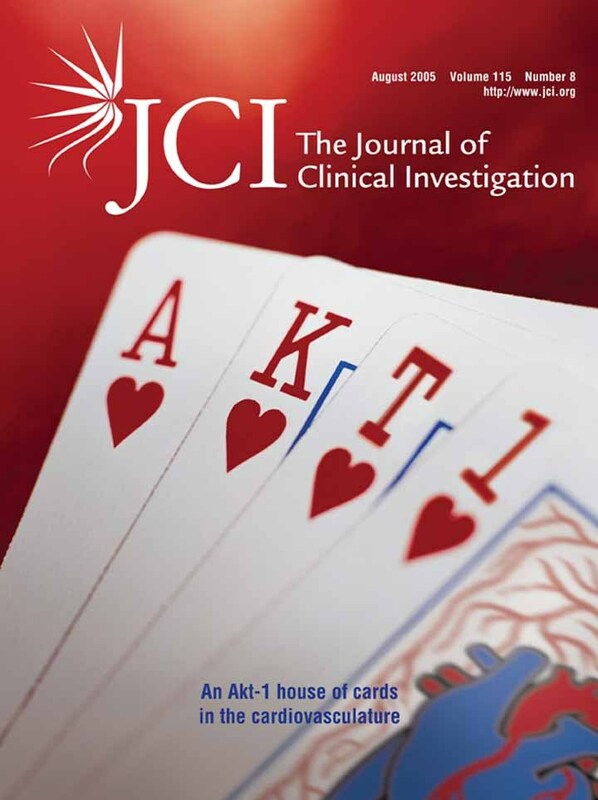 It concludes that their educational presentations lack scientific accuracy and are poorly presented. The second document assesses Narconon’s claims for both its educational and rehabilitation facilities. A team of researchers performed an extensive literature search to uncover only five research papers that examined Narconon. One was unavailable and two were strongly negative. Only one suggested that Narconon’s practices were beneficial – and that was undertaken by Narconon itself. The overall conclusion is that the Narconon educational and rehabilitation programmes are not supported by science, nor is there any evidence that their practices produce positive results. Some people may raise an eyebrow at such an uncompromising condemnation. I don’t blame them. It is reasonable to doubt that a highly-motived film actor who caters to a mass market (and depends on the goodwill of the public) would risk his career by promoting dangerous pseudo-medical practices. This is why I have added links to one of the interviews that is analysed in the article below. Watch, and judge for yourself.